We were delighted to welcome Celyn Kenny to the school this morning. Celyn is an ex-pupil of Ysgol Gymraeg who will soon be aiming to conquer Mount Kilimanjaro, Africa's highest mountain, in order to raise money for Childreach International. Celyn shared an interesting presentation with the pupils about the journey she will take on this Summer. The School Council have decided to organise an event to raise money to sponsor Celyn, and show our support. Best of luck. Over the weekend many of the school's pupils competed in a football tournament held in Talybont. Several teams were successful in various age categories, with one team winning a final with a Golden Goal! Pictured are some of the youngest boys to compete, boys from Year 2, with their medals for being runners-up and third in their respective teams. We done everyone who competed. We enjoyed listening to the achievements of these two pupils in our morning assembly. Lisa (along with several other pupils) has been successful in her Life Saving exam in the sea. Thank you for sharing this with us, Lisa. Dion's certificates show his achievements in swimming 1,000 metres, as well as a Mile! Quite and achievement! Thank you both for sharing your success with us this morning. Congratulations to every pupil who travelled down to Carmarthen to compete in the Dyfed Sports. The team managed to come 2nd out of around 50 primary schools. Congratulations to the school's Year 4 Cricket team on their achievement in winning the Ceredigion 50/50 tournament. In order to win the competition, the team needed to win all three of their group games, achieving so with wins of 91-65, 88-82 and 97-81. In the final, they managed to win by 112 runs to 82. The team will now go on to compete nationally at Cardiff Castle on July 3rd. Following their success in the county round, a group of pupils competed at national level in this year's Books Competition organised by the Welsh Books Council. Although they didn't scoop a prize, the children performed and discussed their choice of books very well. The highlight of the day was meeting the new Bardd Plant Cymru - Aneirin Karadog. The children thoroughly enjoyed his session, and we look forward to welcoming him to the school in the near future. Many congratulations once again to four Year 6 pupils on continuing their success in the 24 Game. After winning the Aberystwyth Schools round, Eleanor, Dylan, Peredur a Lisa went on to win the Ceredigion County round also. 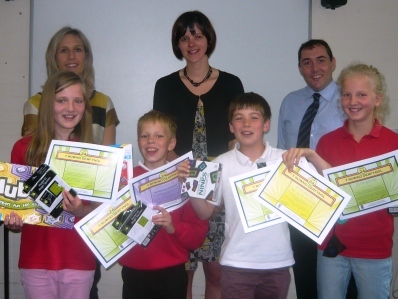 Thank you to Liwsi Harries, Rhian Rees and Mike Carruthers of the Education Authority for organising the activities. 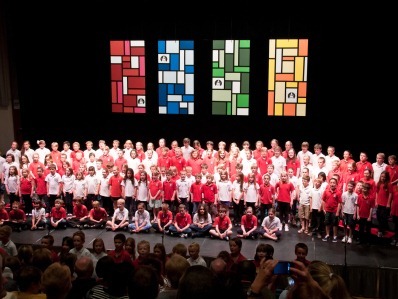 The Great Hall was a sell-out once again this year as every pupil had an opportunity to perform to parents, grand-parents and friends on the big stage. Congratulations to seven pupils on their achievement in this year's Aberystwyth Show which was held over the weekend. Arwen won first prize for her painting of a sheep on a plate, Catrin Haf second for making a rabbit out of dough, and Gethin also second for making a duck out of dough. Summer came third for making a kangaroo out of dough, Iestyn third for making a mouse out of dough, Ben third for his painting of a wolf on a plate, and Mia third also for her painting of a rainbow. Years 5 and 6 pupils had an amazing three days at the Urdd's Residential Centre at Glan-llyn recently. The weather was fantastic as were the activities as usual. The pupils were given a chance to conquer the climbing wall, go canoeing, have a trip in a boat across the lake, battle the assault course and the tower, go swimming and orienteering, ending with a very noisy disco indeed! Many thanks to the centre's staff for their work and to the school's staff for their care of the children over the three days. Congratulations to Sioned from Year 6 on her recent success during the Whistsun half-term holidays. Sioned had a very busy week in all, having competed and won the Aquathon held at Machynlleth, then coming second in the Fun Run held at Aberaeron, and third in a Swimming competition in Llanelli.